Winter is on the horizon—the season when tent campers pack up their camping gear in favor of warmer, indoor digs. But for RV campers, frigid weather doesn’t mean the camping season is over. That’s because RV camping allows you to experience the joys of camping (ample time outside, campfire cuddling) with the comforts of home (warm blankets on your own bed, a heater). While your RV may allow you to camp all year round, make no mistake that not all RV campgrounds are created equal. 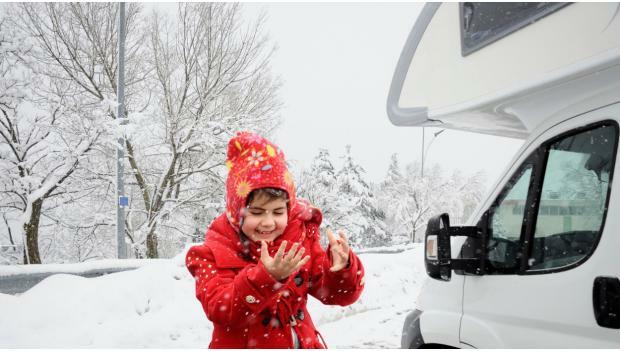 Winter-friendly RV campground amenities like full-hookup campsites, hot tubs, indoor laundry, hot showers, game rooms and easy access to nearby entertainment will upgrade your winter camping experience. 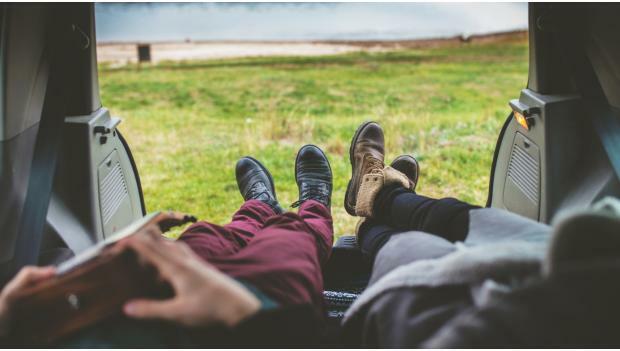 From Ohio to Colorado, Arkansas, New Mexico and beyond, we’ve rounded up some of the great RV campgrounds in America to help you pick a winter camping destination that will please and entertain you during the coldest months of the year. 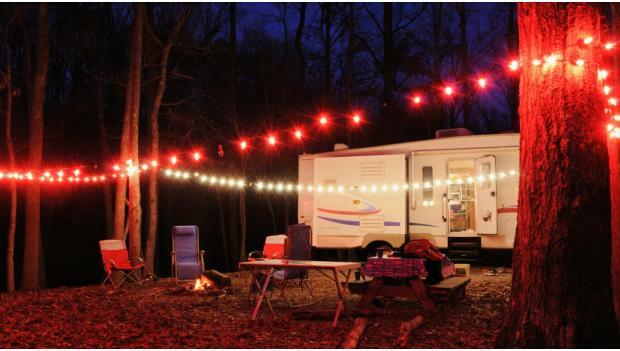 Check out these 17 great RV campgrounds across America. 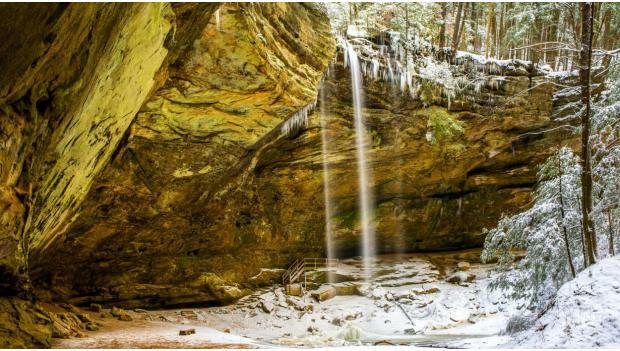 Beautiful in every season, southeastern Ohio’s Hocking Hills State Park is special in the winter, when it’s possible to spy frozen waterfalls or hike to Hocking’s famous caves on footpaths covered in snow. RV campers will find electric sites available for reservation with fun amenities like a playground and game room. Non-electric sites are also available if you like tent camping in the winter. Located just minutes from Hot Springs National Park, Hot Springs National Park KOA offers year-round full hookup RV sites. The campground also has an arcade room, billiards, hiking trails, a pet playground and laundry facilities. There’s no better way to rejuvenate in the wintertime than soaking in the hot thermal waters of Hot Springs National Park. Located on the Virgin River just minutes from Zion National Park and other outdoor wonders of the area, Zion River Resort provides full-hookup sites for RV campers. Other year-round amenities include an off-leash dog area, game room, social hall and spa. The high desert of central Oregon is stunning all year round but has a raw beauty to it in the wintertime when snow often sweeps through the area. Central Oregon is a recreational wonderland and located right in the middle of it all is Redmond / Central Oregon KOA. The campground offers full hookup campsites and is just a short drive to the rock-climbing haven Smith Rock State Park. Featuring jaw-dropping views of the Rocky Mountains and the Denver skyline, Dakota Ridge RV Park is perfectly situated to explore Colorado’s famed wilderness and Denver’s urban delights. The campground has 141 full-service RV sites and amenities, including a fitness center, billiard room and a book and game library. If you’ve been itching to step foot inside the Magic Kingdom there’s no better time to go than the middle of winter. The weather is better, the crowds are smaller and lodging is affordable when you camp in your RV. Disney’s Fort Wilderness Resort has full hookup campsites and provides easy access to the theme park. As an added bonus, you can even see fireworks right from the campground. Located in the heart of Hilton Head Island, this 50-acre woodland resort has full-hookup RV campsites, tennis and pickleball courts and a pool, spa and fitness center. But what makes this upscale RV resort unbeatable is its location. The campground is just a short walk from shops and restaurants of Hilton Head and a quick bike ride to the beach. Wine lovers will rejoice in Napa Valley Expo RV Park located right in the heart of Napa wine country. The year-round full-hookup campground is the perfect place to make your base as you explore the vineyards of Napa and Sonoma valleys. When you’ve had your fill of wine, historic downtown Napa is just a short walk from the campground. A popular snowbird RV park, this 25-acre campground is situated right in the middle of Texas Hill Country. The park has 3/4 mile of private river frontage for year-round fishing and the full-hookup campsites can accommodate rigs up to 85-feet. Only 50 miles from Austin, the park is well situated for great day trips, too. Nestled into the southern tip of Georgia’s colonial coast, Crooked River State Park is a great place to camp in the wintertime. Its mild temperatures and close location to the Intercoastal Waterway allow campers to stay outside and explore the water. The 500-acre park’s campground offers electric and water hookups, coin laundry and hot showers. Outdoor enthusiasts will love setting up camp at Point of Rocks. The campground offers 96 full-service campsites and is located near hiking and mountain biking trails. When you fancy a day in town, historic downtown Prescott is a 10-minute drive. It’s no secret that the southern California coast is a perfect year-round camping destination thanks to its sunny skies and warm weather. Located 11 miles south of Santa Cruz, the Santa Cruz/ Monterey Bay KOA has full service RV campsites and a host of winter-friendly amenities such as a hot tub that is open year-round, a game room and outdoor games like volleyball, basketball and horseshoes. A popular coastal attraction, Carolina Beach State Park is home to miles of hiking trails and fishing options galore. The campground is situated under shady pine and oak trees and nine campsites offer full hookups. Though the weather on North Carolina’s coast can be cool in the winter, it’s a great excuse to light a campfire. Located near the Sandia Mountains for outdoorsy fun and close to Old Town Albuquerque for easy access to shops and restaurants, Albuquerque KOA has it all. The campground offers full-service, pet-friendly RV campsites as well as winter amenities such as a hot tub available to campers year-round. It’s hard to deny the appeal of a tropical island environment and that’s just what you’ll find at Sunshine Key RV Resort & Marina. Located in the lower Florida Keys, this campground is the perfect place to escape the cold winter and pretend like summer never stopped. This RV resort has 399 full-hookup campsites, some of which are right on the water. Overlooking the bright blue sky and peaceful waves of the Gulf of Mexico, Gulf Beach RV Resort is the perfect wintertime camping destination. Offering 44 full-hookup sites, an onsite restaurant, clubhouse and even a party deck where you can enjoy a happy hour cocktail and watch the sunset, you won’t have to venture off site to find entertainment. A green oasis in the desert, Boulder City is conveniently located to as much wild fun as you’d like in Las Vegas and as many recreational opportunities as you can take advantage of in the wilderness surrounding Boulder City. Canyon Trail is a full-service RV Park right smack dab in the middle of everything. With a dog run, laundry and year-round swimming pool, they’ve got everything you need to set up camp and stay awhile this winter.